Transformers: Lost Light #25 Review – AiPT! Tying together and putting a bow on stories from the last 13 years! The final fate of the whole Lost Light crew revealed! All things end. The current IDW Transformers comics universe comes to a close this month. The first series to finish is Transformers: Lost Light. So what is the final destination of the Lost Light and is it a fitting end to one of the greatest runs in Transformers comics? Before discussing this issue first we need to talk about the series itself. Transformers: Lost Light (and its predecessor More Than Meets The Eye), redefined what you can expect from a Transformers comic. 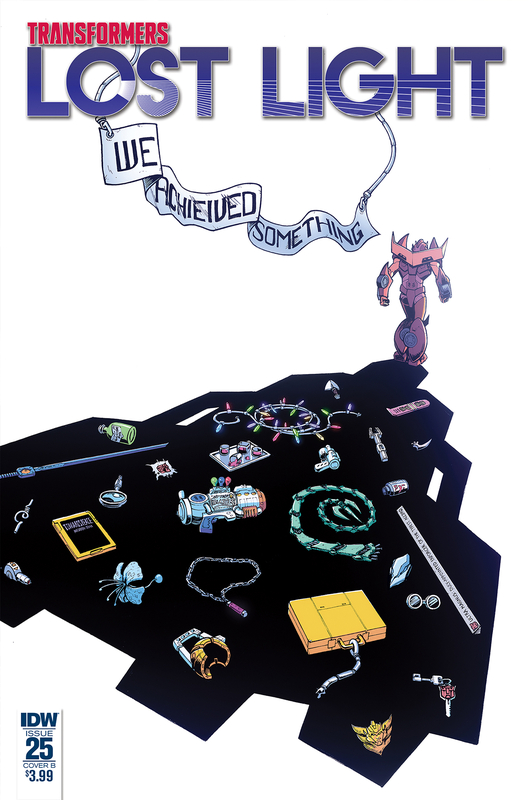 For a series based on toys, Lost Light was never driven by action sequences and violence. Yes, it had its fair share of fights, high stakes and horrific deaths but in the end they were more about the choices and consequences of these events. MTMTE/LL will always be about the characters: It’s about the rag tag crews of the Lost Light, the Weak Anthropic Principle and even the DJD. It was about taking a cast of transforming alien robots, many of whom couldn’t even be called C-list, and making you care about them. James Roberts took his cast of robots and made them more human than most of the Homo Sapiens written in comics today. He played with so many different concepts throughout his run; Love, trauma, self loathing, faith, regret, vengeance, memory, grief, idolizing others and redemption. For me the greatest strengths of Roberts’ run have been the humour, the character work and the relationships. Roberts built a fascinating cast of characters with distinct personalities, full of strengths, flaws and foibles. Many of the relationships, romantic or otherwise, are among my favourite in comics from the last five years. These elements make a lot of the characters relatable to the reader, with that connection being behind a lot of the series success. Transformers: Lost Light #25 begins with a death. The narrative of this issue jumps from the far future to soon after the events of issue 24, which works a lot better than telling the story in a linear fashion. We get to see where the future takes most of the characters, with the story bringing a mix of laughter, tears and joy. So many characters have brilliant moments that show just how far they have come since they first boarded the Lost Light. For me the highlights included Whirl, Ultra Magnus, Cyclonus & Rodimus. There are so many little references, call backs and pay offs that made me smile or cheer. The big achievement of this issue is the sheer number of emotions that are generated. This issue may not please every MTMTE/LL reader, but there will be moments that resonate with everyone. Some may feel that some characters didn’t get enough time. It may not fully please those who have issues with some of the redemption themes in the series. In order to be spoiler free I won’t say why but in many ways this ending is perfect for the end of a series that isn’t creator owned. One of the questions about this ending was how it would fit in to the ongoing stories of Transformers: Optimus Prime and Transformers: Unicron. The answer is that it doesn’t kowtow to the IDW Transformer universes’ main storyline, as Unicron isn’t even mentioned. Personally, I think that it is the right decision to keep the ending separate — letting the series end on its own terms is what it deserves. As we all know, a comic isn’t just about the writing. Considering that the previous 6 issue story arc had 4 artists, it’s fitting that Jack Lawrence is the artist here. Lawrence has really grown throughout his run on LL and his expressions here were perfect. The way he captures all the emotions, the mood and the atmosphere is brilliant. Lawrence’s biggest strength is how much personality he can fit into large scenes full of characters, where you just stop to look at every part of those panels. Honestly, I hope that he is on the short-list of artists for the Transformers comics relaunch in 2019. Joana Lafuente and Tom B. Long, the colourist and letterer for the entire run of LL, have been such an integral part of the series feeling and are a key part in the achieving feel of the book. Even the three cover variants are fitting as Lawrence, Nick Roche, and Alex Milne were all key figures in MTMTE/LL. Each of the covers triggers memories and emotions from throughout the series. I just want to say thank you to everyone who had a hand in MTMTE/LL. This has been one of my favourite series this decade, a series that I have read again and again. If this is Roberts’ last foray in Transformers comics then I honestly hope that someone, somewhere gives him an opportunity to write another comics series if he so wishes. His writing is just too entertaining and too good for this to be the end. Then again, if his career does start and end with Transformers then it is fitting that he bows out on a high. Transformers: Lost Light 25 is a perfect way to end MTMTE/LL. This issue has everything that made the series special: It has the humour, the character development, the cheeky nods & clever references, the layers, and the emotional connection. In many ways it is both an ending, a celebration and a reminder that life is not about the ending but about the journey and the moments and relationships that are made on that journey.